November | 2012 | JUDDER! Goodness me, it seems like weeks since halloween, but what an amazing night it was! Yet again, you amazed us with your costumes and the atmosphere was brilliant, with Adam Lab4 dropping a couple of incredible sets, the whole venue was rocking from the moment we opened the doors! All the photos are up at judder.org’s gallery, but if you have more to share, drop us a line, and you could in free entry to the next Judder! 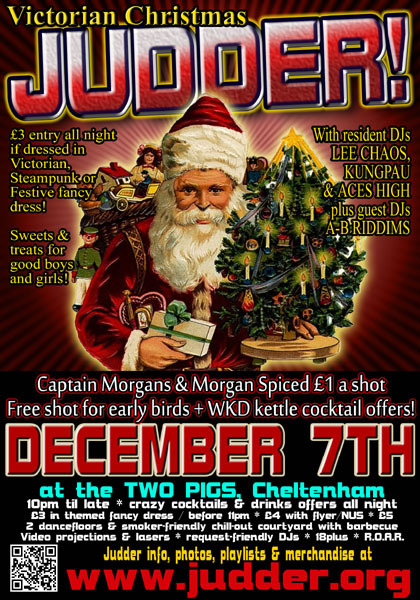 So, we’ve just got ne more Judder in 2012, our Victorian Christmas party on Friday December 7th, with guest DJs A-B Riddims keeping it filthy, and with Captain Morgans and Morgans Spiced just £1 a shot to keep the winter chills at bay. We’ll have gifts for good boys and girls, and entry is just £3 if you come dressed in Victorian or Christmas fancy dress, so come and see the year out in true Judder style! and what about next year? Well, we’ve got the dates confirmed, but for our 10th year of mayhem, we’re letting *you* choose the themes! So vote for your favourites, and we shall announce the winners just before the next Judder… VOTE NOW! Oh, just one more thing… if you want something else to look forward, keep 21st December free in your diary, non nod, wink wink! See you on the 7th December! Hey thereJudder boys & girls!